When I started taking classes after high school, I was able to learn a lot of financial lessons from people I met. Some of the lessons I learned were great, whereas others were not so good. This is one of the better lessons that I learned. One of my best friends (Mike) had to pay his own way through college. Unlike many of the friends I made during undergrad, Mike needed a way to earn money. Fresh out of high school, Mike didn’t have any skills employers wanted, so he took the first job he was able to lock up…waiter! Now before you judge people who choose to wait on tables, this is a good first job for a college freshman, and my friend Mike was able to make it extremely profitable for him. The layout of Mike’s restaurant was one fairly similar to most. The hostess put the customer’s name on a list and figured out where you could sit. Availability of seating was based upon how quickly customers left and how quickly the tables were cleared by the bus boys. When Mike started at the restaurant, he was paid minimum wage plus tips. He talked to some of the more senior waiters are the restaurant and found out they were being paid slightly more than he was. By slightly, we are talking about a quarter raise every 6 months, if you were on good behavior! At a possible 50 cents raise per year, it would take Mike too long to make it worth his while to keep working. Mike needed to make more money quickly, which was difficult with his busy schedule of school, friends, and working at the restaurant. Mike started paying more attention at the restaurant, and recognized the fact that if his tables were cleared faster, he would be able to serve more people. If he were able to serve more people, he would make more money in tips and not have to increase the amount of hours he worked at the restaurant. Mike also recognized if he put in a little effort to try and keep the customers’ drinks filled, and to be available when he was needed, people would be out of the restaurant more quickly meaning more customers to serve in a given amount of time. Now the restaurant had a policy that waiters, servers, and bus boys all shared their tips. By sharing tips, this meant the waiters gave a portion of their tips to the servers and the bus boys. 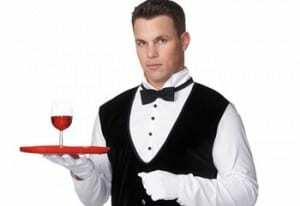 The accepted restaurant policy was to give 10% of your tips to the bus boy, and 10% to your server. Initially, he played the game just like the rest of the waiters, but he noticed most of the waiters weren’t interested in working very hard. Mike figured if he was willing to put in more effort than the other waiters, people would likely leave a larger tip, and they would probably be out of the restaurant faster. If you know the direction this story will turn, you are a quick thinker like Mike. Mike needed to figure out a way to get his tables cleared faster, keep his customers happy but also wait on more people so he could increase the amount of tips he earned. He went and talked to the bus boys and servers who normally worked the same shifts as him and cut them a deal. He told them he was willing to pay them 15% each for their tips, if they would clear his tables first. He also promised them if he was able to increase his tips by a significant amount, he would up their percentage to 20% each. As I am sure you can imagine, Mike always had tables available in his section, his tips increased significantly over the other waiters in the restaurant, the servers and bus boys loved earning a little more money, and the hostess at the front of the restaurant always knew they could sit customers when Mike was working because he had tables available. Mike may have not made a lot of other waiter friends because he was always working and not always hanging out in the back room, but Mike did plenty of fine living in the freshman dorms. The take home message that Mike understood better than everybody at the restaurant was that he would rather have 60% of a larger pie, than 80% of a smaller pie! Mike told me the waiters at his restaurant were already happy with how much they were receiving in tips, and most weren’t trying to find ways to make more money. Most of the waiters wanted to spend as little time with the customers as possible, and then hang out in the back as much as they could with the other waiters. A little ingenuity and understanding the process was all it took for Mike to become the waiter receiving the greatest amount of tips in the restaurant. I really feel that everyone should be a server at some point in their life: it teaches you so much about work and interpersonal relationships in general that it is an invaluable experience regardless of what field you end up in. This is a great application of serving to writing; I love these ideas. I am sure that the customer service aspect is useful in all areas of business. I was not cut to wait tables; and I have to add that I don’t consider this to be beneath me – I am just too clumsy to do it well. But I LOVE the message of this post and the way in whcih it was delievered – indeed, it is much better to have a slightly smaller proportion of a much bigger pie than the whole of a small one. We often forget this; we do worse – we forget that it is better to have 50% of a pie than 100% of nothing. I am so posting this one on Facebook! I don’t see how they can carry so much food on a tray. I am like you and would probably drop many meals and break lots of dishes. Ha! Even professionals do it. Have I told you about a tray of dirty plates being dropped on my back in a place in Madrid? And Spanish food is very fatty. Horrid, this was. I can’t imagine having something like that dropped on me. Fortunately, I have only had simple things like a little bit of water spilled.